Why is Honest-1 Auto Care so Family Friendly. Probably because you have been to some automotive repair shops and left feeling like you might be getting ripped off or taken advantage of. At Honest-1 Auto Care we are here to do everything we can to help you feel at home and part of our family. We are a family that includes Honest and Certified Technicians. 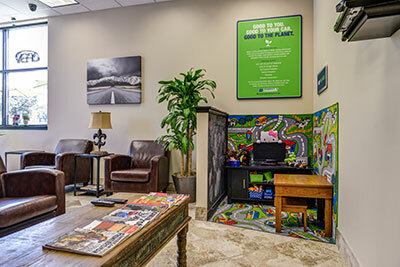 We offer a warm place where you can relax have a great cup of coffee, check your emails at our internet café or just sit back and watch family friendly TV on our flat screen television all while our family of technicians is performing our Comprehensive Vehicle Inspection on your car. There is a warm safe place for the kids to play and even watch cartoons in our kids play area while you know you are getting a fair shake on the work needed for your vehicle and never sold something you don't need! Whatever your vehicle needs our certified technicians can handle all repair challenges. If one of those unexpected challenges ever does come along and you get stuck we will run you to work and pick you up from work. We are family and here for you! What's even better is that we are always looking at how we not only can be family friendly but also more earth friendly. Each of our locations is 100% ESA certified as ECO-Friendly Stores. Whenever possible we use our proprietary line of 14 earth-friendly fluid services that will breathe new life into your cars lifeblood. So enjoy peace of mind that we are taking care of you, your family, our Earth and thanks to our clearly stated 36 month / 36,000 mile Nationwide warranty we can take care of all of it no matter where life takes you! Our repairs no matter how large or small are backed by this warranty with a smile and friendly handshake. So come on down, see how we are truly different and be part of our Family at Honest-1 Auto Care!